Bill Nighy (Love Actually) is world-weary,scrupulous MI5 spy Johnny Worricker in threegripping films seen on Masterpiece. Writtenand produced by David Hare, the seriesfeatures an all-star cast: Michael Gambon,Rachel Weisz, Judy Davis, Christopher Walken,Winona Ryder, Helena Bonham Carter, RalphFiennes, Felicity Jones. Includes Page Eight,Turks & Caicos, and Salting the Battlefield. "Totally absorbing" -- Variety. 5 1/2 hrs, 3 DVD or Blu-ray discs, SDH. Mature audiences. Johnny Worricker (Bill Nighy) is hiding out from his work at MI5 on the tax-exile island paradise Turks & Caicos. Trouble comes knocking when an encounter with a CIA agent (Christopher Walken) forces him into the company of some dubious American businessmen. 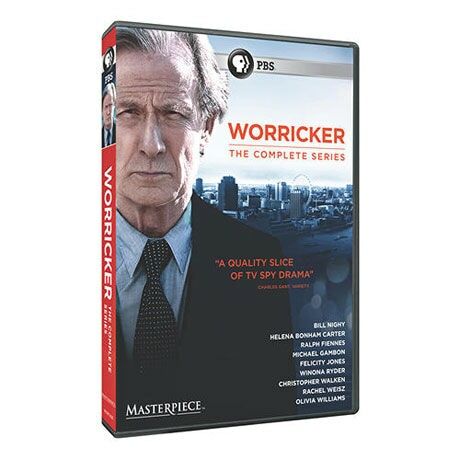 Claiming to be on the islands for a conference on the global financial crisis, Worricker soon learns their shady activities extend far beyond the business of luxury hotels. When one of them turns up dead, it's their financial PR (Winona Ryder) who seems to know more than she's letting on. But will she help Worricker come to an understanding of what these men do and why they're here? Worricker tries to persuade a former girlfriend (Helena Bonham Carter) to betray her boss in London in order to gain more information. 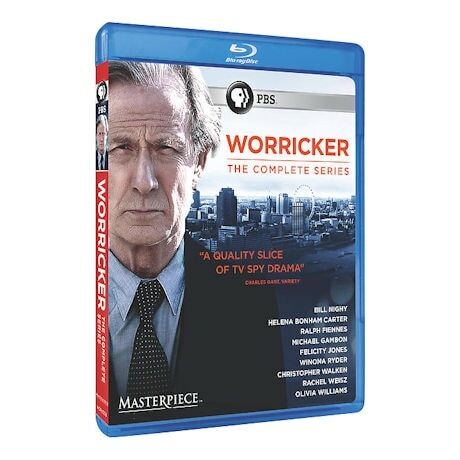 As evidence linking the men to Prime Minister Alec Beasley (Ralph Fiennes) comes to light, Worricker must act quickly if he is to survive. MI5 officer Johnny Worricker (Bill Nighy) and Margot Tyrell (Helena Bonham Carter) are on the run together across Europe, going from town to town in Germany. But Worricker knows his only chance of resolving his problems is to return home and confront his nemesis - the prime minister, Alec Beasley (Ralph Fiennes). To do this, he's going to have to bring to light some unsavory facts about the prime minister's financial and business arrangements. But Worricker is haunted by the suspicion that he's not the only person out to undermine the prime minister. Page Eight - Bill Nighy, Rachel Weisz, Michael Gambon, Tom Hughes, Judy Davis, Rakhee Thakrar, Saskia Reeves, Ewan Bremmer, Felicity Jones, Richard Lintern, Holly Aird, Andrew Cleaver, Kate Burdette, Ralph Fiennes, Alice Krige. Ralph Fiennes, Helena Bonham Carter, Hansel Piper, Dylan Baker, James Naughton, Zach Grenier, Julie Hewlett, Rupert Graves, Sally Greenwood, Ewen Bremmer, Malik Yoba, Kobna Holdbrook-Smith, Meredith Eaton. Salting the Battlefield - Bill Nighy, Helena Bonham Carter, Ralph Fiennes, Anna Boger, Shazad Latif, Felicity Jones, James McArdle, Saskia Reeves, Daniel Ryan, Leanne Best, Judy Davis, Ewen Bremmer, Olivia Williams, Kate Burdette, Rupert Graves.